The 2018 competition was held on May 6 – 7, 2018 at Mount Allison University, Sackville, NB. Congratulations to all 2018 Envirothon NB teams! Complete Results are below. Fredericton, NB – Five students from Stanley High School, Maddie Carr, Dee Carr, Emma McArthur, Lesley Spencer, and Reilly McWade, won top honours at the Envirothon NB competition that took place at the University of New Brunswick (UNB) in Fredericton this weekend with a field testing component at the Maritime Forestry Complex. The 16th annual environmental science competition was host to 57 students from across New Brunswick and a guest team from Prince Edward Island. Competing in five-person teams, the students’ year-long preparations helped them gain knowledge and experience in the areas of forestry, soils and land use, aquatic ecology, and wildlife. Throughout the school year, participants attended workshops, led by experienced natural resources specialists, blending class time with hands-on field experience. The Stanley High School team will represent New Brunswick at the North American Envirothon, July 24-29, 2016, at Trent University in Peterborough, Ontario. The Envirothon NB program offers high school students a chance to better understand local ecosystems and sustainability issues, learn from environmental professionals and explore career options in the environmental and natural resources fields. All participants were eligible to receive to $500 scholarships to the Faculty of Forestry and Environmental Management at UNB. Envirothon NB is an environmental science program for high school students across New Brunswick. The program is supported by many organizations and companies, including: New Brunswick Environmental Trust Fund, New Brunswick Wildlife Trust Fund, Natural Resources Canada, JD Irving Limited, University of New Brunswick, Fundy Model Forest, SFI- Canadian Woodlands Forum with special thanks to Agriculture & Agri-Food Canada, the Department of Education, Petitcodiac Watershed Alliance, Irishtown Nature Park, Nature Conservancy of Canada, Ducks Unlimited, and the many volunteers that make this program an excellent experience for high school students. 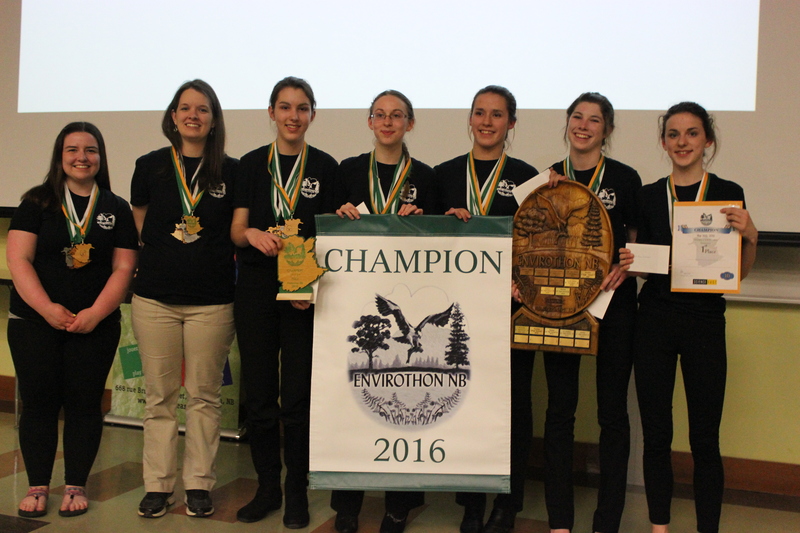 Saint John, NB, May 26th, 2015– Teams from Stanley High School and Oromocto High School won the 2015 Envirothon NB competition, held this week in Saint John. The Stanley High School team, “The Stanley High Buffleheads,” was the non-competitive winner, and the Oromocto High School team, “Lost in the Woods,” was the competitive winner. 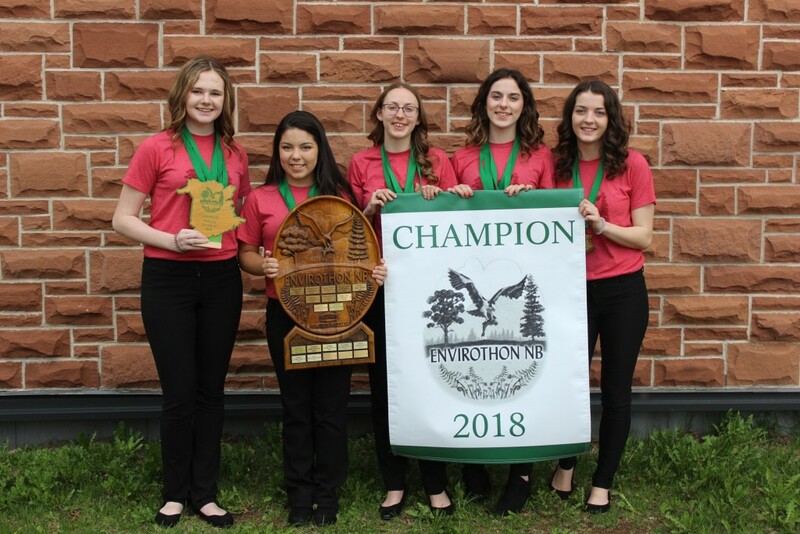 That means Oromocto High School’s team is eligible to represent New Brunswick at the North American Envirothon, happening in July in Missouri. The 15th annual environmental science competition culminates a full year’s study in the areas of forestry, aquatic ecology, wildlife, and soils and land use. The participants attended workshops conducted by skilled natural resources specialists, combining in-class teaching and hands-on field experience throughout the school year. Two founding members of Envirothon NB were also recognized at this year’s event. Chris Pitt and Kelly Honeyman were presented with 15-year service awards at Monday’s awards ceremony. Stanley High School team members are Owen Foreman, Dee Carr, Reilly McWade, Maddie Carr, and Emma McArthur. Dee Carr is in grade 8; she and Maddie Carr are sisters. Thank you to all of our supporters, judges, and volunteers who have made this a wonderful experience for the teams and their advisors. We hope that Envirothon NB Alumni return next year to volunteer.